The ECS2000-10P/18T/18P/26T/26P/50T/50P are entry-level managed switch with 20/36/36/52/52/100/100Gbps switching capacity. It delivers wire-speed switching performance on all ports connecting end stations to the corporate network. There are two SFP ports for Gigabit Ethernet fiber uplink flexibility. Optional Gigabit Ethernet SFP transceivers can be installed for various fiber uplink distances. IEEE 802.1w Rapid Spanning Tree Protocol provides a loop-free network and redundant links to the core network with rapid convergence, which ensures a faster recovery from failed links, enhancing overall network stability and reliability. IEEE 802.1Q VLAN-segmented broadcast domains reduce broadcast traffic and increase LAN security and performance. IEEE 802.3ad Link Aggregation Control Protocol (LACP) increases bandwidth by automatically aggregating several physical links together as a logical trunk and provides load balancing and fault tolerance for uplink connections. Eight egress queues per port enables differentiated management of up to eight traffic types. Traffic is prioritized according to 802.1p or DSCP, giving optimal performance to real-time applications such as voice and video. Port Security allows access to a switch port based on MAC address. This limits the total number of devices from using a switch port and protects from MAC flooding attacks. IEEE 802.1X port-based access control ensures all users are authorized before being granted access to the network. User authentication is carried out using a standards-based RADIUS server. Access Control Lists (ACLs) restrict access to sensitive network resources by denying packets based on source and destination MAC addresses, IP addresses, and TCP/UDP ports. ACLs are hardware supported, so switching performance is not compromised. IP Source Guard can be enabled with DHCP snooping on trunk ports with a large number of VLANs to filter and control IP traffic access to the network. The ECS2000-10P/18P/26P/50P can provide up to 30 Watts of power to attached devices, such as VoIP phones, wireless access points, surveillance cameras, etc, all over existing Cat. 5 cables. 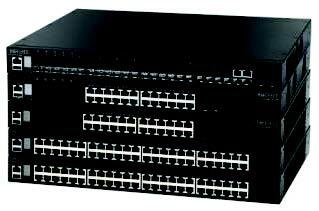 The switch can deliver up to 30 Watts on 2/4/6/12 ports, 15.4 Watts on 4/8/12/24 ports, or 7.5 Watts on 8/16/24/48 ports. This eliminates the need for individual power sources for devices in the network, saving on costs for power cables and avoiding power outlet availability issues. If the power demand exceeds the switch’s maximum power budget, ports can be prioritized to receive power. 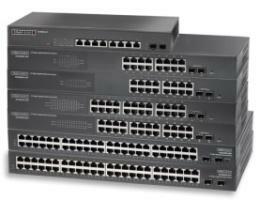 The Edge-Core ECS2000 series is a Layer 2 Edge switches featuring 10/18/26/50 ports w/wo PoE; with 8/16/24/48 10/100/1000Base-T ports, and 2 SFP 100/1000Base-X SFP slots. The ECS2000 series enable networks of all sizes to introduce Gigabit Ethernet to the desktop with management features targeted to meet the needs of SMB network. It is packed with features and is a cost-effective solution that brings continuous availability, QoS priority queuing with classification, and prioritization at Layer 2.